Atlantic (1929) (also known as Titanic: Disaster in the Atlantic for its home video release) is a British black-and-white film, directed and produced by Ewald André Dupont and starring Franklin Dyall and Madeleine Carroll. Originally, two versions were made, the English and German-language version Atlantik were shot simultaneously. Subsequently, the production of a French version (Atlantis) began in spring 1930 using different footage and partially an altered storyline. The fourth version was released as a silent film. Atlantic is a drama film based on the RMS Titanic and set aboard a fictional ship, called the Atlantic. The main plotline revolves around a man who has a shipboard affair with a fellow passenger, which is eventually discovered by his wife. The ship also has aboard an elderly couple, the Rools, who are on their anniversary cruise. Midway across the Atlantic Ocean, the Atlantic strikes an iceberg and is damaged to the point where it is sinking into the Atlantic. A shortage of lifeboats causes the crew to only allow women and children in (though the captain allows a few men to take to the last remaining boats as the disaster reaches its zenith) and many couples are separated. Mrs. Rool refuses to leave her husband and after the boats are gone all the passengers gather on the deck and sing "Nearer, My God, to Thee" as the Atlantic sinks into the ocean. The final scenes depict a group of passengers saying the Lord's Prayer in a flooding lounge. An urban legend claimed for many years that the movie was filmed aboard the White Star Line ship RMS Majestic. However, this is untrue, as the White Star Line would never have permitted their current flagship to stand as a set piece depicting the worst disaster in their company's history. 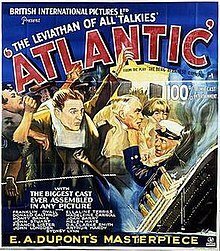 Atlantic was instead partly filmed on board a P&O ship, the [[RMS Mooltan|Mooltan] Indeed, the film was originally made as Titanic but after lawsuits it was renamed Atlantic. These lawsuits were initiated by the White Star Line, which owned the RMS Titanic, and which was still in operation at the time. (White Star had in fact also owned a liner called RMS Atlantic which was lost in 1873, but at the distance of half a century it was no longer considered as immediately traumatising as the Titanic). The final scene of the movie was filmed as a shot of the liner sinking, but it was cut at the last minute for fear of upsetting Titanic survivors. Atlantic was one of the first British films made with the soundtrack optically recorded on the film (sound-on-film), and was Germany's first sound movie feature. In England, it was released in both sound and silent prints. The French version was the fourth French feature with sound-on-film. As the first sound film about the sinking of the Titanic, it is also the first to feature the song "Nearer, My God to Thee," which is played by the ship's band and sung by passengers and crew. ^ "Atlantic (1929)". Rotten tomatoes. Retrieved 31 May 2012. ^ Gareth Russell, The Darksome Bounds of a Failing World: The Sinking of the Titanic and the End of the Edwardian Era (London 2019), pp. xvi-xvii. ^ Mcgue, Kevin (12 April 2012). "The Titanic on Film". A Life At The Movies.